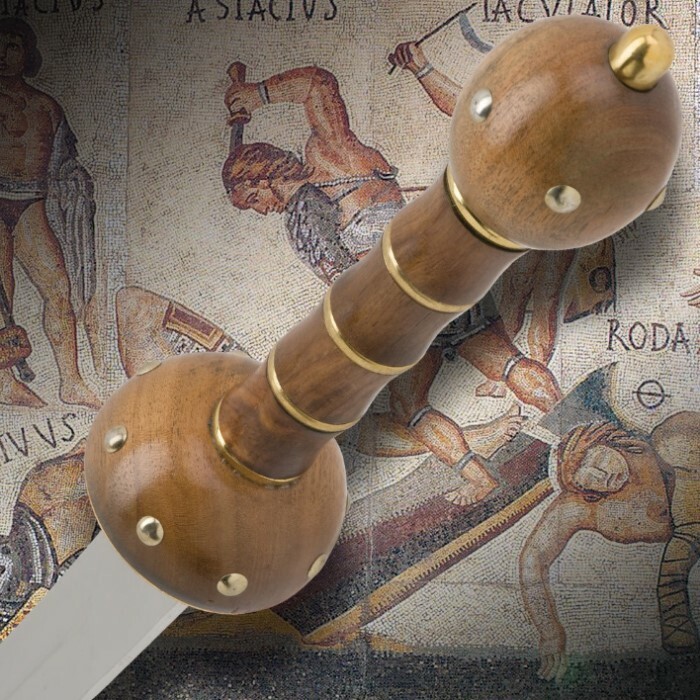 By far the most famous among Roman daggers and swords, the Gladius sword was designed for sidearm wear as a quick and easy to maneuver weapon. This replica offers a 23 5/8 in. double edge style, stainless steel blade. The hardwood handle is adorned with brass spacers coordinating with the brass bolsters on the pommel and guard. Includes a genuine leather sheath with belt strap. 33 in. overall. Response: Please contact customer service, and we will be happy to explore an exchange or return for you. 800-735-3326. So first off its more of a two handed grip which is not historically accurate for a gladius. The blade is obviously cut not forged and it is not cut well. The blade is not even on both sides. It is slightly curved on one end and angular on the other. Another weird thing is mine didn't come with a sheath. Also I was swinging it around one day (not hitting anything just slow swordsman drills) and the pommel popped off and the whole grip fell apart. I was able to put it back together but now I cant even pick it up with out it falling apart. So its purely a decorative piece, and a bad one at that. Sorry to say it but this is one of the worst purchases I have made on BUDK and they are usually awesome. The blade is thin, flimsy and wobbly, very disappointed. The wood handle is quite nice though. Ordered this with a few other items for $39.99. It is pretty cheaply made even for $39.99 and wobbly and dull. I just returned it and saw the price dropped to $19.99. I might have kept it for that price and saved the shipping charges. Not up to budk standards. so far this has been a great sword. some things i did not know about it before i ordered it was: this sword is rat tale tang, then my hand does not fill the space between pommel and hilt there is about 1 1/2" - 2" extra handle and i have big hands, in the info that is given for this sword it says "22 1/8" stainless steel blade with two massive blood grooves" this sword does not have any blood groves. although i did not know all this it still good sword for what i need it for. 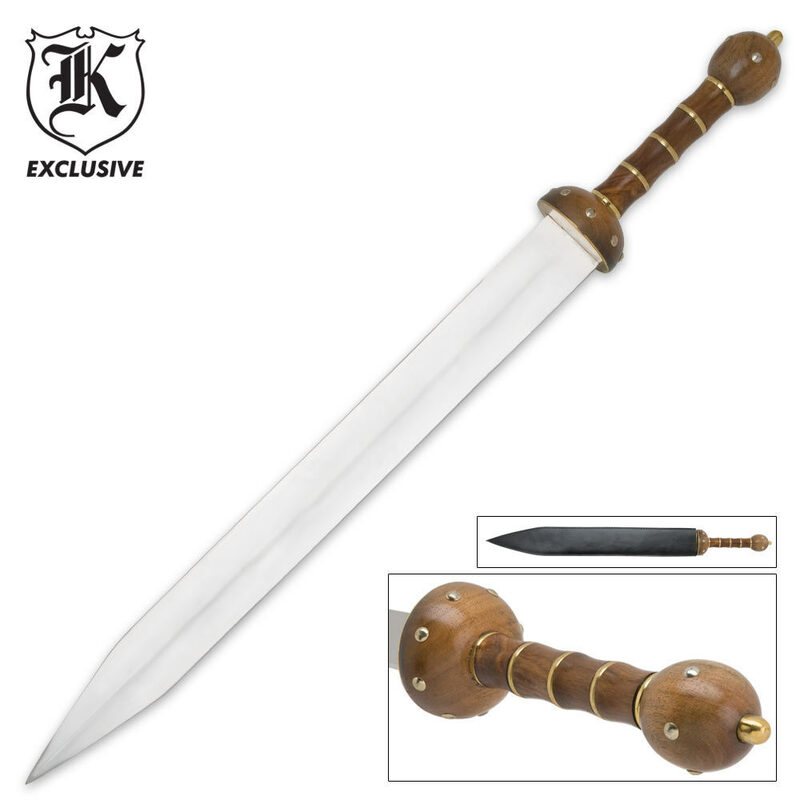 THIS IS A MASSIVE SWORD WITH A HEAVY STEEL BLADE WHICH FITS WELL IN IT'S SHEATH & IS COMFORTABLE TO HOLD. IT REMINDS ME OF THE PINE SWORD I USED TO PRACTICE WITH AS A YOUNG WARRIOR. WIELDING THIS SWORD OVER MY HEAD I CAN HEAR THE ROMAN MOB SCREAMING FOR BLOOD; "HAIL SPARTACUS!" My second purchase from trueswords. Mine required minor adjustments on the handle. Sturdy feel, real wood handle, nice blade, and nice sheathe. Very beautiful sword. Impressive to behold. Great buy! This is a hefty well made sword that is more than worth the money. Itï¿½s bigger that the pictures would have you believe and the stainless steel appears to be of good quality and looks as if it could take a fine edge. You have to hold this sword to appreciate the power of these things in the hands of those old time Roman soldiers. Iï¿½m more than happy with the sword and the sheath is not bad either. Itï¿½s real leather and the only thing I donï¿½t like is the way the strap is affixed around the handle with a modern snap. Itï¿½s a minor issue and could easily be changed out for something more appropriate to the time period. All in all it's a great buy.